We’re taking the three-day food bank challenge next week! 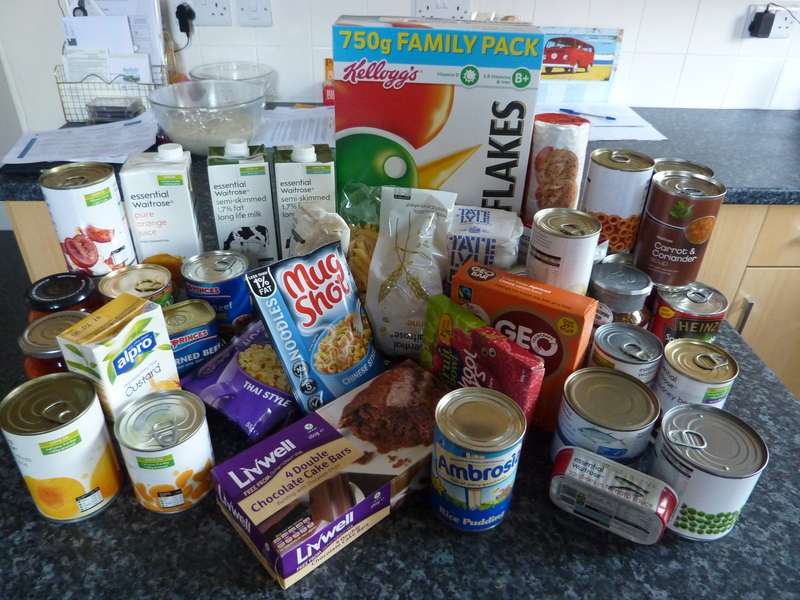 Starting on Monday, our family of four will only eat the food which a family of four would get in a typical Trussell Trust foodbank parcel. We’re doing this as part of the End Hunger Fast. This campaign in running through Lent, standing in solidarity with people in this country who are going hungry, and calling for changes to end this scandal. My daughter was concerned that we’d be taking food from someone who really needed it! But I reassured her that we’d get the food ourselves from the supermarket, which I have done in preparation. As you can see, it is mostly tinned and dried food. No fresh fruit or veg for three days, although some food banks do manage to find ways to give out fresh food. However, sometimes people have to give the fresh veg back as they can’t cook it, not having enough money to pay for electricity or gas. I’ll be recording our daily experiences on Facebook, and I’ll write here again at the end. So far, apart from missing fresh stuff, one of the challenges will be finding stuff which can be packed up for school lunches. Not everyone who comes to a food bank is entitled to free school meals for their children. The three-day food parcel is for anyone facing a crisis leaving them unable to feed their families. Debt, fluctuating hours of work, illness and unexpected bills can all push people over the edge. The other issue will be lack of choice and flexibility. Careful planning will be needed to make sure the food can be turned into 9 meals and we will be limited to what comes in the parcel. But we’re optimistic that we won’t be hungry, which, after all, is the point of the food bank. Anyone who knows us IRL might remember the food challenge we took last year – to live below the line on £1 per person per day for food for 5 days. After that, anything is possible. This is an artificial situation for us. We are doing it to draw attention to the campaign and as an act of solidarity. But I’ll leave you with a link to A Girl called Jack’s blog, who can tell you what it is really like to go hungry.